I have done other blogs on the members of Canned Heat who were at the Woodstock Music and Art Fair on their birthdates. If you’d like to read about Alan Wilson, Bob Bear Hite, Harvey Mandel, Larry Mole Taylor, or Adolfo de la Parra, please click on their name/link. The band released Canned Heat the album in July 1967, shortly after their appearance at the Monterey International Pop Festival. The personnel on the album differs slightly from the band that appeared at Woodstock. In 1966, the band had recorded another album, but their label did not release it. In 1970, Janus Records released that album as Vintage Heat. On the 1969 album, Henry Vestine is the lead guitarist. He will be that until August 1969 when Mandel replaced him. The band’s drummer at the time was Frank Cook and his time with the band was even shorter than Vestine’s. de la Parra replace Cook shortly after the album’s release. The members of the band loved the blues as their name, a nickname for the poisonous but alcohol-based Sterno, implies. 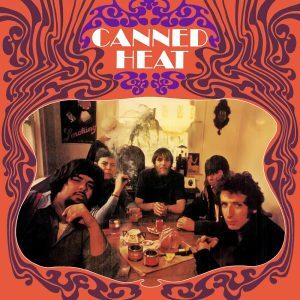 Old bluesman Tommy Johnson had a song in 1928 called “Canned Heat Blues.” It told he sad story of an alcoholic desperately drinking Sterno, nicknamed “canned heat.” Here’s the opening track of their first album…a song that Johnny Winter also loved to cover. As you can see, all but one of the tracks was a cover and from a variety of writers. Where the band went following this first worthwhile effort is a story that sounds like many other band stories. Personnel changes. Substance abuse. Premature deaths. Reunions with surviving members. Nowadays John Paulus and Dale Spalding are with original members Fito de la Parra and Larry Taylor. See them soon!